I can’t say that I’d given much thought to docks before I joined the TDP! I’ve only gradually come to realise that there are various different sorts of docks, and we use the same word for places where ships are built and repaired, and for places where cargoes are loaded and unloaded. When we talk about Docklands or the London Docks, we mean cargo docks, but the Bermondsey and Rotherhithe foreshore once had plenty of examples of the other, shipbuilding kind. From the late 17th century and into the mid 19th century, ships were being built in small docks all round the Rotherhithe peninsula, and also on slipways. The Stanford map of 1862 shows twelve docks round the peninsula, and there were two more we know of in Bermondsey, Fountain Dock and Fore and Aft Dock. These show up on old Ordnance Survey maps, and at Fore and Aft Dock there was a dry dock and a wet dock together. A dry dock is mostly kept dry, the lock gates are shut and the water pumped out as necessary. They are designed for shipbuilding and repair. A newly built ship can be gradually floated when the lock gates are opened and the tide comes in, a ship that needs repair is brought in on the tide and settles gradually as the tide goes down and water is pumped out. Then the repairers can get at the sides of the hull to work on it. On the Bermondsey foreshore now, all you can see of these docks is a dolphin and some alteration in the river wall. (Interestingly, the wall the TDP has just looked at at Cannon Street had in it a blocked up sluice, such as would be needed for a dry dock.) The last time a large ship was built in Rotherhithe was in 1870, but ship repairs, barge building and ship breaking went on into the 20th century. There was just not enough space in Rotherhithe for docks to expand to build the larger ships, as cargo docks were filling up the interior of the peninsula. 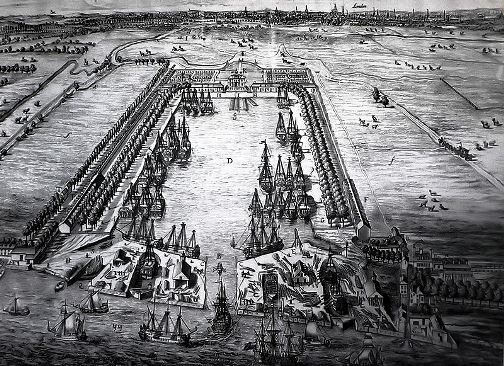 The first of the large, water-filled, docks in Rotherhithe was the Howland Great Wet Dock, which opened in 1700, where the Greenland Dock is now. There is an excellent picture of this, which also shows two dry docks and two slipways. But the wet dock itself was intended for ships to shelter in, and for fitting them out and doing minor repairs – more like a harbour than anything else. There were screens of trees planted along the sides to protect ships moored there, and they were very effective in the great storm of 1703, which caused much damage elsewhere. The point of a wet dock is that you mostly keep the water inside it at the same level as the tidal river, by shutting lock gates. The Howland Great Wet Dock did not have facilities for loading and unloading ships, although this is another reason to have wet docks. It makes it easier to load and unload ships if they can be kept at roughly the same height in relation to the quayside. Up to the end of the 18th century, cargoes were still being dealt with at riverside quays. So what changed? For a start, the sheer volume of traffic meant that by the mid 18th century the river was very crowded, and merchants were petitioning for an extension of the legal quays, the area on the north bank of the Thames between the Tower and London bridge, where customs dues were collected. Sufferance wharves were established, including Hope Sufferance Wharf in Rotherhithe, which still has it’s name painted on it. Here smaller ships were “suffered” to unload their cargoes, while the more expensive cargoes from larger ships were dealt with at the legal quays. Trade was seasonal, with all the ships from the West indies coming in between July and October. Delays in dealing with goods, which might be left piled on the quayside, meant that pilfering from ships was highly organised and a real problem by the end of the 18th century. It was estimated that one fiftieth of all sugar, and a fortieth of all rum imported, was stolen. The West India Dock Act 1799 and the London Dock Act 1800 enabled the building of the first large docks of the kind we think of as Docklands. 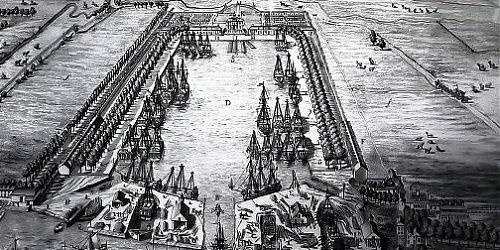 They had their own legal quays and bonded warehouses, and were surrounded by formidably impressive walls. They also had their own private police forces, and dockers could be searched as they left work. At first the West India Dock had a monopoly on all the trade from the West Indies, except tobacco, which went to the London Dock, as did rice, wine and brandy. More docks were built south of the river, in Rotherhithe, where a lot of Baltic timber was imported. But there were still plenty of other cargoes to be dealt with on the riverside, and we can still see this very clearly in Rotherhithe and Bermondsey today, where the foreshore has the remains of barge beds, mooring features, and wall-mounted cranes. Photos of the river from the early 20th century show barges moored several deep along the riverside. So this is my brief guide to docks, it has cleared up some confusions for me and I hope for you too.